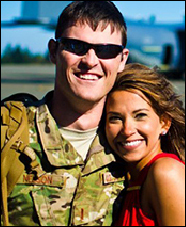 United States Air Force Captain Nathan Nelson suffered a spinal cord injury from a rocket blast in Afghanistan. He has no movement below his chest and limited use of his hands. Captain Nelson was part of a special operations team that took heavy fire in September of 2013 during his third tour in Afghanistan. Luckily, none of his fellow soldiers were injured in the attack. He was immediately flown back to Walter Reed National Military Medical Center, and, after a dozen surgeries, he's working through rehabilitation. He was then sent to James A. Haley Veterans’ Hospital in Tampa, where he is still undergoing treatment. In addition to his spinal cord injury, among the injuries Captain Nelson suffered were a traumatic brain injury, severe shrapnel wounds, multiple spinal fractures, severe tissue damage to left ankle, collapsed lungs, and severely bruised organs (liver, heart, lung, bowels, kidneys). He also underwent a massive blood transfusion and tracheostomy, and suffered numerous other injuries. For his service to the country, Captain Nelson received the Purple Heart, Air Force Commendation Medal, Army Commendation Medal, Army Achievement Medal, Air Force Organizational Excellence Award, Air Force Good Conduct Medal, Air Force Recognition Ribbon, National Defense Service Medal, Afghanistan Campaign Medal, Global War on Terrorism Service Medal, Air Force Legacy Service Award, Air Force Basic Military Training Honor Graduate Ribbon, Air Force Training Ribbon, and the NATO Medal. Building Homes for Heroes is currently constructing a ground-up, mortgage-free home for Captain Nelson, his wife Jennifer, and their 3-year-old daughter in Santa Rosa Beach, Florida.